SERIAL GANKER: How much market share can Mythic steal from Blizzard? How much market share can Mythic steal from Blizzard? Mark Jacobs at Mythic recently made a crack about not needing to cannibalize WoW subscriptions, or at least all of them. His poem is pretty witty, but it prompted me to think about where Mythic plans to get it’s subscriber base for Warhammer Online. Blizzard is largely unique in the MMO marketplace in that they became a cultural phenomena that attracted lots of new MMO gamers to the marketplace. In the four years since WoW’s release, the MMO market in the fantasy genre has really matured. While I don’t believe that MMO subscriptions overall have peaked, the rapid growth that WoW experienced is pretty unlikely to keep occurring in the fantasy setting genre. The result of this is a more mature and established market. All future games (like Warhammer) will largely need to find their success by attracting gamers away from other MMOs. So while Mark might not want ALL of the WoW subscriptions, he certainly seems to need SOME of them in order for Warhammer to be a success. The goal of the exercise is to engage in a discussion about the possible Warhammer market share. Therefore, I only selected MMOs which I felt directly compete with Warhammer in the Fantasy genre and use the monthly subscription model. Guild Wars has reportedly 4.5 million accounts, but were not included because they don’t use the monthly subscription model. Warcraft reportedly has 10 million accounts, but approximately 8 million of these are accounts that are hourly subscriptions in Asia. AoC recently released subscription figures at the end of Q2, so those are the figures I used. Clearly, Blizzard is the dominant player in this market and commands 61% of the current market share. From a historical perspective, Warcraft has four times the number of subscriptions as the nearest competitor ever had at its peak. Interestingly, the much older MMOs still have relatively strong subscription numbers. 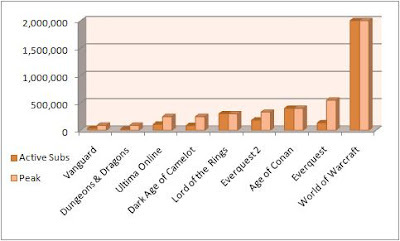 Even after all these years, EverQuest still retains 25% of it’s peak subscription base. It is a remarkable and unique trait amongst MMOs that significant numbers of players will continue to play them long after they have become obsolete. The fact that they decline, but don’t completely disappear is a very important characteristic to consider when thinking about the long-term viability of cannibalizing another MMOs market. 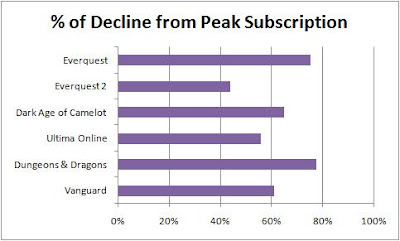 Amongst the MMOs that have experienced decline, the average % of decline from their peak subscription number is 63%. The MMO which experienced the most decline is Dungeons & Dragons (78%) and the MMO that experienced the least amount of decline is EverQuest 2 (44%). The fact that DDO and the original EQ still retain 22-25% of their peak subscriptions is an important figure that we can apply to the current World of Warcraft subscription numbers. This core group of “4 Life” players may never unsubscribe. Likewise, we can reasonably assume that such a popular game as WoW would at least behave similarly to EQ2 and would largely not be at risk of ever losing more than 44% of the peak subscription base. The above logic is important because we can project some scenarios about Market Opportunity to the World of Warcraft subscription base. The point here is not to determine how many players will play Warhammer, but to measure the opportunity or potential market size that you could attract. 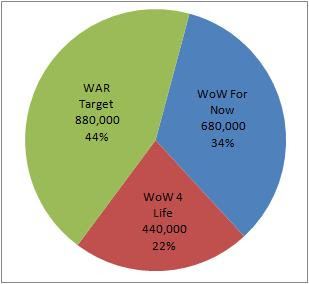 In the above chart, you will note that I have assigned 22% of the WoW subscriber base as “WoW 4 Life” players who will never unsubscribe. That’s 440,000 accounts and a bigger number than any other current MMO. In fact, it’s almost as large as EverQuest at peak subscription. Any notion that WoW will be “killed” is ludicrous under such circumstances. If you enjoy playing WoW, then have no fear that it will ever go away. I also indicated 44% as “WAR Target” players who might be willing to switch games. There is no reason to believe that they WILL switch games, only that this is the biggest group of WoW players that Warhammer could reasonably attract. Consider this to be the MAXIMUM market potential that WAR could expect to cannibalize from the WoW subscription base. The remaining 34% or “WoW For Now” is the group of players that won’t play forever, but also aren’t likely to leave the game anytime soon. From Blizzard’s perspective, they should be thinking about how to eventually transition the “WoW For Now” group to some eventual next-gen MMO. Of more immediate concern are the “WAR Target” players who are the biggest flight risk, but these "For Now" players are also a long-term flight risk Blizzard should be thinking about now. I went ahead and applied similar logic to the rivals I felt most likely to lose share in an effort to determine where Mythic can reasonably expect to gain market share. I used 44% as a base number with the exception of DAoC subscriptions (75%). The total market opportunity is a bit more than 1.3 million subscriptions and Warcraft players consists of 66% of that potential market. Up until this point, I have really only performed an exercise to assess market potential. This 1.3 million figure is a reasonable and logical assessment that provides an approximate estimate of the opportunity potential. It’s worth pointing out that this isn’t just the opportunity for Warhammer Online, but any other new MMO that would want to enter the market at this particular time. I’m only talking about it in context of Warhammer because that’s the game looking to enter the market. So if 1.3 million is the maximum opportunity, how much of it will they capture? A similar figure existed for Age of Conan and they clearly failed to capture anywhere near the total market opportunity. Will Mythic do better? The answer to that question is pure conjecture. 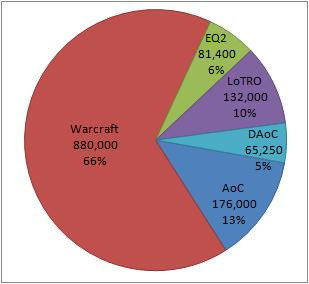 Not that this makes a huge difference in your analysis, but MMOGchart claims that the WoW regional breakdown as of January '08 was 2.5 million NA, 2 million EU, and the rest Asia. I haven't seen anything more current with the breakdown (which matters a lot to Blizzard's bottom line, since the Asians don't pay much). Guild Wars claims to have sold over 5 million boxes, but that number is misleading because of the way their expansions work; I represent four of those boxes. It's also a bit more complicated to figure out who is actually playing the game. Do I still count even though I'm not playing at the moment? On the other hand, the reason why I bought the game in the first place is because it has no monthly fee so I don't feel guilty having it onhand so I CAN play it whenever I'm feeling bored but not looking to cancel a current game. The other thing that makes life more complicated is that current subscriptions does not represent the total number of players, as it excludes people who aren't playing anymore. If, for the sake of argument, you presume that there are an additional 1.5 million former WoW players in NA/EU, that matters at lot to WoW's ceiling, because a larger proportion of them might be in the market for a new MMO compared to the ones who are still playing WoW. Thanks for the heads-up on the WoW figures. It makes a big difference in the overall size of the potential market, but not in the methodology of the analysis. The important take away from this exercise is that 22% of an MMO’s peak subscription may never unsubscribe, 34% are at moderate risk of leaving, and 44% represents the most serious flight risk. It’s that 44% that represents the best market opportunity for a competing MMO. There are a number of potential pitfalls in assessing the actual size of the opportunity. For one thing, we don’t exactly have full disclosure into private figures, so some of the data is old or a bit inflated. Another pitfall, as you point out, is in assuming that people didn’t already leave WoW and are playing something else. Yet another is that some people will have multiple subscriptions across several games. Still – even with those pitfalls we can glean a few helpful facts by measuring the decline in other MMOs. Applied to your 4.5 million number for North America & EU subscriptions, there are 990,000 WoW subscribers who may never unsubscribe within the next decade. Put in perspective, that’s still almost twice as many accounts as EverQuest at it’s peak. As I mentioned in the article, any notion that WoW will ever die with that many subscribers is ludicrous. WoW can’t be killed. Diminished perhaps, but not killed. Honestly, I even find it hard to consider 1 million subscribers in any context as “diminished”. However, the main question I was trying to answer in this article is what is the maximum amount of market share that Mythic (or any MMO) can expect to steal away from Blizzard? I think a reasonable expectation is that 44% is the most share that any game could hope to steal from them. Your point about Guild Wars is well taken. Any analysis that doesn’t include it will understate the overall opportunity because Guild Wars is seemingly the second most popular MMO. I say seemingly because it’s model makes it impossible to know exactly how many people are playing. Tipa did an interesting little analysis with XFire data that estimates GW at around 300,000 players. My bet is that is a close estimate. Someone also had an interesting point about Guild Wars (I wish I could recall who) that described it like a gateway drug. The basic thought being that people who wouldn’t subscribe to a monthly MMO would buy GW and get ‘hooked’ into it and then transition to a “real” MMO like WoW. 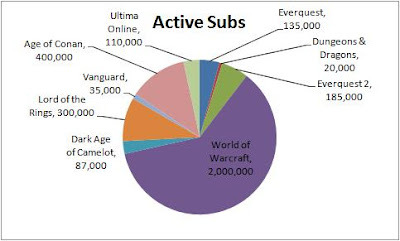 Doesn't matter for your analysis, but, according to their last release of figures, WoW is now pushing 11 Million subscribers world-wide. Of course, the vast majority of those are in Asia. And strangely enough, WoW isn't even the most popular MMO in Asia. I think you've broken everything down quite nicely with the assumptions and publicly available numbers. In terms of AoC, I believe they mentioned selling up to 800,000 boxes and shipping 1M. At the time, 800k would have been pretty close to the maximum opportunity based on your hypothesis (if you subcract AoC's numbers from the mix). The trouble with AoC is that they've only managed to retain ~50% and are now sitting at around 400k. Well, this is all interesting but I think a couple of factors need to be added to your analysis. Firstly, War is RvR and pvp focused and poses a greater threat to Blizzards disenchanted pvpers than any other game so far. As such, a breakdown of pvp popularity is Blizzard would allow you to fine-tune your predictions. 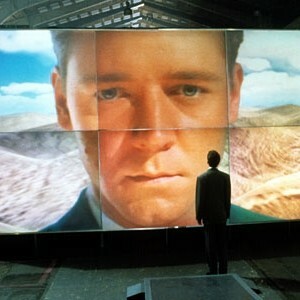 Second, as wow demonstrated, "break-away" commercial success hinges upon becoming a "cultural phenomenon" if you will. The South Park episode and clever marketing did more to grow their numbers than pulling people from other MMOs. If War manages to generate enough momentum through such means and grow a "new" subscriber base, the resulting buzz would have a spin-off effect and more wow players would be attracted to it. This is kind of an economic multiplier effect. In any case, I realize that the above points are hard to measure and thus makes your analysis even more challenging. I see wow becoming more and more of a game for youth and other alternatives such as war and aoc as appealing to older palates. Expect wow to be strong for a long time, but don't be surprised if War is the next MMO to break the 1 Million subscriber mark!